A village of East Lothian, Gladsmuir lies 3 miles (5 km) west of Haddington. Now bypassed by the A1 trunk road, it takes a linear form along the north side of the A199 road. 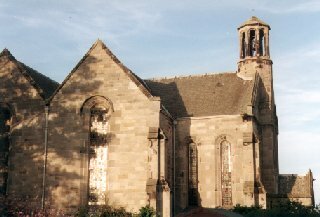 The parish church was built in 1838 to a design by William Burn, replacing an earlier church now in ruins and dating from the 17th century. Professor William Robertson (1721-93), historian and Principal of the University of Edinburgh, was parish minister here (1743-58) and the goldsmith George Heriot (1563 - 1624), who endowed George Heriot's School in Edinburgh, may have been born in Gladsmuir which was certainly the birthplace of his father. Gladsmuir developed as an industrial village associated with the working of coal and fire-clay and with an iron works which operated in the latter half of the 19th century. A railway branch-line once linked Gladsmuir to nearby Macmerry and in the 1990s a Science Park was developed at Elvingston to the north.